When a group of ramblers from Kilmarnock visited Montgreenan in September 1922, they observed the milestones collected by the proprietor, Sir James Bell, which were placed “in twos and threes where the side-paths join the avenues”.1 They have suffered further weathering and accidental depredations since then. With a view to preserving a record of them, the author surveyed the stones in March 2009, and in what follows endeavours to place them in their geographical and historical context. Sir James Bell (1850-1929) was a Glasgow worthy. He held many offices, and served as Chairman of Glasgow Life Insurance Company, Deputy-Chairman of Glasgow and South-Western Railway, and Deputy-Chairman of the Clydesdale Bank. He was created a baronet in 1895, and subsequently purchased the Montgreenan estate.2 The milestones noted by the ramblers were thus probably collected by Bell in the first two decades of the twentieth century. However, as will be argued below, they may have been removed from the roads many years earlier. 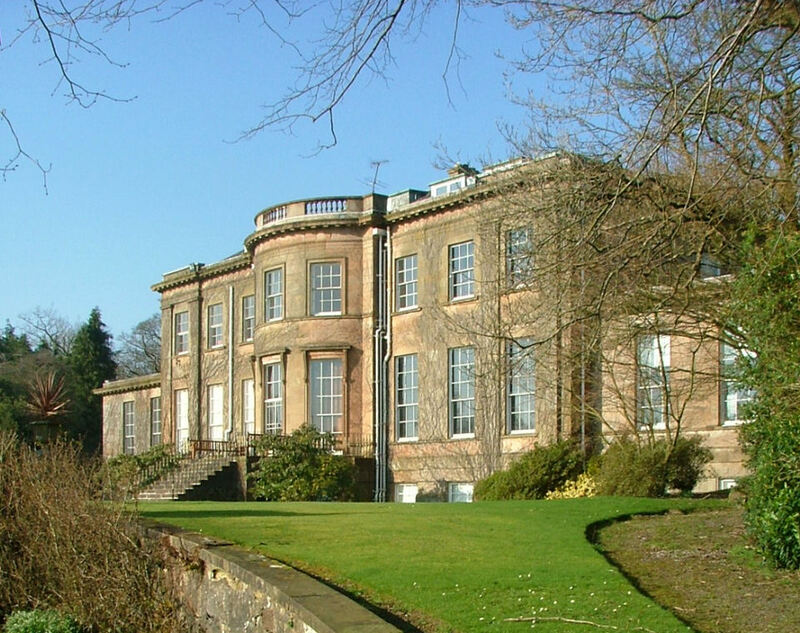 Montgreenan lies in the Ayrshire parish of Kilwinning.3 The mansion was built for Dr Robert Glasgow in 1810-17. It continued as a private house until 1982, following which it was run as a country house hotel for a number of years. This was closed at the time of the survey, reportedly with a view to reopening at an unspecified date. The wooded grounds are in multiple ownership, and some parts are fenced around as private gardens. The author found and photographed 19 milestones, and their locations are shown on Diagram 1 below. Three, 14, 15 and 16, had been resited in recent times. Though all the main avenues were explored it is not impossible that there are other stones not found during the survey. 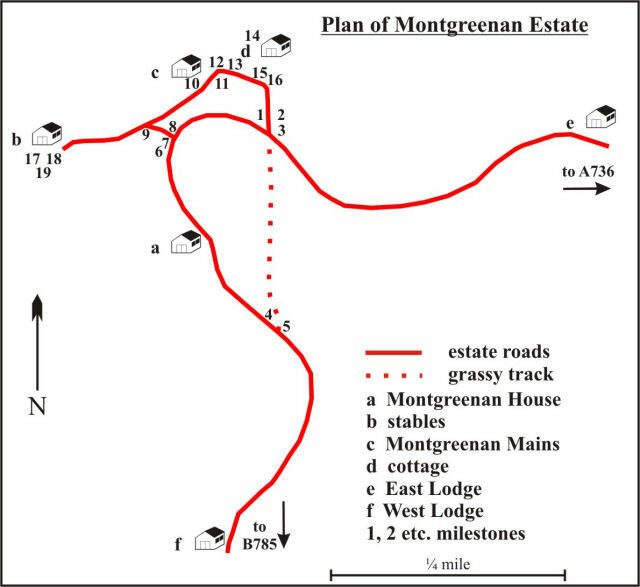 Diagram 1: Plan of Montgreenan Estate showing milestones. Click on a number to go to the description of the milestone. Although the provision of milestones was stipulated in the first Ayrshire Road Act in 1767 there is no evidence that the trustees treated this as a priority. In the extensive records of the trustees references to milestones are few and far between. In October 1778 the roads trustees at their general meeting in Ayr decided that roads should be measured and milestones erected.4 However this is the only occasion when milestones are mentioned in the 18th century. The subject does not occur in any of the minute books concerning individual roads in the Act. In one set of minutes, those for the road from Kilmarnock, by Mauchline, to Old Cumnock, the secretary and treasurer Gavin Hamilton recorded his accounts. Items included payments to individual road-makers for making and repairing stretches of road, but not for the erection of milestones. The next occurrence was in February 1808, when it was recorded that milestones were to be set up on the road from Irvine through Stewarton to the county boundary, and on the road up the coast from Irvine through Saltcoats and Largs, again as far as the county boundary, which in this case is at Kelly Bridge.5 Note that milestones ‘were to be set up'; not repaired, not replaced, not added to, but set up, from which we may infer that there had been no previous erection of milestones on these roads. Yet these were two of the principal roads of the 25 in the first Act. In the terminology of the road acts each individual road constituted a district (‘District of Roads’). However from the early 19th century, after the 1805 Act, the road committees coalesced into three principal districts: those meeting at Ayr, Kilmarnock and Irvine. The general meeting of road trustees for the county continued to be held at Ayr. As we have seen above, the earliest records of milestones relate to roads within the Irvine district. In 1832 there is evidence that the Kilmarnock district had begun to pay attention to milestones.6 On 5 th January the trustees accepted the following “offer for erecting milestones and fingerposts”. The last item shows than milestones had previously been erected on the road from Kilmarnock to Irvine. Since the Kilmarnock minutes before 1830 are not extant, we can deduce no more than that the date was before 1830. It is traditional to convert such figures to present values. By the calculator on the Measuring Worth website, the total of £72 16s. is equivalent to £5280 in 2013 according to RPI, and £53100 according to average earnings.7 The price offered for a single large milestone was 11 shillings. By the same calculation, this is equivalent to £45.00 in 2013 by the RPI index, and to £401.00 by the index of average earnings. Finally the price of 12s. 6d. for a single large fingerpost is equivalent to £45.30 or £456.00. In each case it is probable that the higher figure would prove to be a considerable underestimate of the cost of providing and erecting a similar item today. Neither the replacement of the old stones Wilson recalled in the late 19 th century nor the later removal of some of them in the 1940s corresponds with Bell’s supposed collection of the Montgreenan stones during his tenure at Montgreenan. Perhaps they had been abandoned in some yard when he came upon them. Turnpike roads in Ayrshire appear in the various Turnpike Acts for the county. The author has numbered the turnpikes in order of their appearance in these Acts, T1, T2 etc. Those relevant to the Montgreenan milestones are listed below as they were described in the Acts. In determining the original locations of the stones it was found convenient to measure distances on Google Earth (GE), using the feature which allows a path to be drawn and measured, following the line of the roads as shown on the 1st OS maps. The corresponding National Grid Reference (NGR) can be found using an online coordinate converter.10 The NGR in turn can be used to find the location on the 6 inch maps of the 1st OS on the NLS website. Many of the milestones come from roads within the Kilmarnock District, making Railton’s 1856 map of the turnpikes in Kilmarnock District particularly useful.11 The table of roads from this map is reproduced below. The turnpikes in this table are referred to in the text as R1, R2 etc. By examining the sometimes incomplete information on the stones in conjunction with these sources it was possible to determine original locations for most of the stones with confidence. This article is illustrated with photographs of the Montgreenan milestones. Below each photograph is a transcription of the engraved legend. The location of the stones at Montgreenan is shown in Diagram 1. Many of the stones are clearly sandstone, and have suffered to some degree but others, such as milestone 10, are of granite or a similar hard stone. The original locations determined for the stones are summarised in the table below and the issues for each will be discussed briefly in the following. Column 1: The Montgreenan milestones numbered in the order in which they were found. Click on a number to go to the description of the milestone. 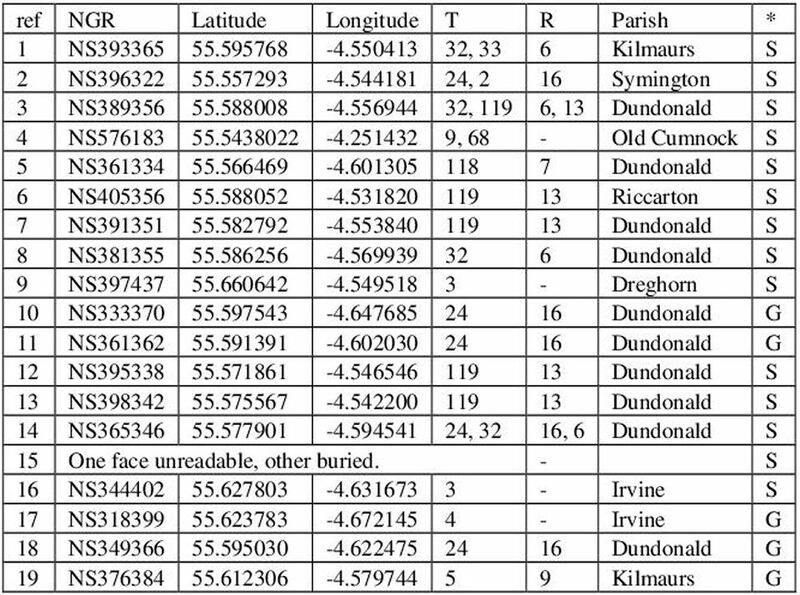 Columns 2-4: Where the stones were sited, as determined by the author, by National Grid Reference and by latitude and longitude. Column 5: Turnpikes numbered by the author in the order in which they appeared in the Ayrshire Road Acts. Column 6: Turnpikes numbered according to Railton’s Map. Column 7: Parishes in which the stones were sited. Column 8: S = Sandstone or similar; G = Granite or similar. One stone (15) cannot be placed due to its condition. The site of one of the stones (4) was in Ayr District and three (9, 16 and 17) were in Irvine District. The remaining 14 were all in Kilmarnock District, and 13 of these lay conveniently around Dundonald and Gatehead: 1, 2, 3, 5, 6, 7, 8, 10, 11, 12, 13, 14 and 18. They are shown on Diagram 2 below. The remaining stone (19) was on the Irvine-Kilmarnock road. Five of the stones were clearly of granite type: 10, 11, 17, 18, 19. Click on a number to go to the description of that milestone. The discussion will be continued with the locations of individual stones. Note: In the descriptions of the milestones where a distance digit is uncertain it is italicised. In instances where a digit cannot be deciphered ‘?' is used in its place. 'R' and 'L' denote right and left-pointing arrows respectively. See Diagram 2: Roads in the neighbourhood of Dundonald c. 1860 . From the place names, distances and arrows on the stone its location would be at the junction just outside Gatehead of the road to Crosshouse with the road to Kilmarnock. Distances were measured on Google Earth (GE) in decimal miles, then converted to miles, furlongs and yards.12 In turnpike terms the location of milestone 1 is at the junction of R6/T32 with R12/T33 (the National Grid Reference is NS393365). In modern terms it is the junction of the A759 and B751. According to the 1st OS 6 inch sheet the milestone here showed Troon 7 Dundonald 2½ and another at the junction immediately to the west with the minor road to Thornton (T32 with T119) showed Ayr 10 Kilmarnock 2½. It is curious that this particular milestone is not the one which was in place at the time of the 1st OS in 1857, if we are to judge by the information on the stone and that recorded by the survey. It appears that the stone shown on the OS map was removed, the stone preserved at Montgreenan was put in its place, and it in turn was removed and subsequently collected by Bell. Similar speculations arise with other stones below. The original location was at the junction of R1/T2 and R16/T24; in modern terms this is on the B730 at the junction with the A77. According to the 1st OS there was a ‘guidepost’ at this junction, and this stone is a guide or direction stone with no distances. Bogend turnpike or toll was also located at this junction, which is still known as Bogend Toll. Apart from the effects of road-widening, the junction is in its historic position, but a major improvement scheme is now in hand. It was on this same road at Littlemill that the young James Pearson Wilson saw old worn milestones being replaced. In all five of the Montgreenan stones came from this road; in order from Irvine: 10, 18, 11, 14 and 2. This was located at the junction of R6/T32 and R13/T119; that is where the road from Symington by way of Fortacres meets the road from Troon to Kilmarnock (B751/A759). There is a close correlation between the distances on the stone and on the ground. Thus ‘Dundonald 2 miles 57 yards' is 2.03 miles, while the distance measured on GE is 2.02 miles; Symington 3.16 miles equivalent on the stone, and 3.09 by GE; and Kilmarnock 3.22 miles on the stone (if it reads 1 furlong) and 3.23 by GE. According to the 1st OS the milestone here bore the information: Troon 6½, Dundonald 2 and Kilmarnock 3¼. Again that is not the Montgreenan milestone. The destinations on the badly-worn right-hand face could be Dalmellington (to the right) and Cumnock (to the left). The milestone was located at the junction near Skerrington of T9 leading from Cumnock towards Sanquhar (the present A76) with T68, leading by way of Benston limework to join T39, the road from New Cumnock to Dalmellington (the present B741). No milestone or guide post is shown at the point on the 1st OS. This junction has been much redesigned, being at the southern end of the Cumnock bypass, but it boasts an extant stone showing the direction to Benston. Note that in the case of the 4 in these fractions only the down stroke is deeply incised; with the deeply incised 1 above, the number may be easily misread. This was located on R7/T118, leading from Dundonald across the hill to Loans. The 1st OS shows a milestone on this road with the legend ‘Troon 3½'. Placing the Montgreenan stone ¼mile further from Troon, leaves the distance to Kilmarnock almost 6 miles, rather than 5¼ distinctly engraved. Because of the curiosity of the place name ‘Old Rome', this particular milestone is the author's favourite. In this context, the article about Old Rome by Paul Crankshaw and Neil Dickson in a previous Ayrshire Notes is worth reading.13 The milestone was located on R13/T119, which leaves R6/T32 (A759) just south of the bridge over the River Ayr near Gatehead and passes eastward by the grounds of Caprington Castle. It was at the lane end of the former Todrigs Mill, near Earlston, from which it was 1 mile to Old Rome farmhouse and 2.57 miles (2m 4 f 123 yd) to Riccarton Church, which is almost exactly the distance on the stone. The 1st OS does not show any milestones on this road. This belongs on R13/T119, the road from R6/T32 (A759) south of Gatehead, which passes Fortacres Toll and continues to Symington. At NS391351 it was (by GE measurement) 1 mile from Gatehead and 2.06 miles from Symington Church. The milestone may have indicated 2 miles 1 furlong to Symington. This milestone is not shown on the 1st OS, which instead records a stone on this road near High Coodham with the distances Ayr 8, Irvine 7¾. This was on R6/T32 (A759) near Fairlie Mains. It is not on the 1st OS, which instead shows a stone at the nearby junction of R6/T32 and R8/T120 at the Newfield lane end, with the distances Dundonald 1 mile and Troon 5½ miles. The Fairlie Damdyke Tollhouse was located at this junction. This stone was on the Irvine-Stewarton road, T3 (B769). The 1st OS shows a milestone with Stewarton 2. The other direction, indecipherable on this stone, was Irvine 5¾. This is an instance of a Montgreenan stone corresponding to a stone recorded on the OS map. This was on R16/T24 near its junction with the Irvine-Ayr road. However it is not shown on the 1st OS, which instead has a stone at the junction with directions Irvine 1½, Dalmellington 25½, consistent with this being the Irvine-Ayrshire turnpike in the first Ayrshire Road Act. The original line of the road took it up the present dead end through Rankinston and over the hill the Dalmellington. This was later abandoned, and the line instead swung west at Littlemill to meet the Ayr-Dalmellington road near Polnessan. The milestones recorded on the 1st OS could thus be the original stones on this road (see also the discussion of milestone 2). This stone was on R16/T24 near Drybridge. However it is not shown on the 1st OS, which does show a stone half a mile nearer Irvine with the distances Irvine 3½ and Dalmellington 23½. The location of this stone was between Fortacres Toll and Symington on R13/T119. The 1st OS shows a different milestone nearer High Coodham with the directions Ayr 6, Irvine 7. This was located at the junction at Fortacres where the 1st OS shows ‘Fortacres Bar' and an ‘m.p.' without further information. Railton's map shows ‘Forty Acres Toll'. By GE Riccarton Church is 2.44 miles, Gatehead 1.67 and Symington 2.07. The arrows can be understood in terms of the angled junction with the stone on the acute corner where the tollhouse stood until a few years ago . The road is R13 and T119. The original support for the toll gate or bar is seen in the foreground. This was located in Dundonald where the Kilmarnock road (R6/T32) met the Irvine-Dalmellington Road (R16/T24). The 1st OS shows a milestone here with the distances Kilmarnock 5, Irvine 5. Milestones 15 and 16 were resited by a resident to flank the driveway to a cottage. Both however were struck by vehicles and sheared at ground level. Number 15 is probably engraved on two faces but only the left-hand face can be seen, on which only the digit 2 is decipherable. As with number 15 above, the upper part of this stone is recumbent (shown upright for convenience), but in this case both engraved faces are visible. This was located on T3 (B769), the Irvine-Stewarton road (as also was milestone 9, above). The 1st OS does not show it, but it is in agreement with other milestones shown on this road at Irvine 2¾, Stewarton 5 and so on. This was located on T4, leading from Irvine by Kilwinning and up the west coast in the direction of Greenock. The actual site is in Irvine, on Kilwinning Road at its junction with Carrick Drive. This same junction can be seen on the 1st OS, and it shows a milestone here with the same distance from Irvine, ½ mile, and Greenock 33½. The two places on that milestone reflect the description of the turnpike. Perhaps the Montgreenan stone was a later one having more local places on it. This is another milestone from the Irvine-Dalmellington road, R16/T24, located alongside the grounds of the former Shewalton House. The 1st OS records not this stone, but one ½ mile further from Irvine, with distances Irvine 3½, Dalmellington 23½. The curious point is that Dreghorn is less than 3 miles from Irvine, yet according to this stone they are 4.8 miles apart. So a milestone with these distances could not be on the direct road, T5, between the two. But on what other road would Irvine and Dreghorn be in opposite directions? There is no such road. The conclusion is that the engraving should read Crosshouse rather than Dreghorn. The cross at Crosshouse lies 4.66 miles from Irvine according to GE, which ties in quite well with the 4.78 to ‘Dreghorn' given by this stone. With this interpretation the location was between Springside and Crosshouse. It is not recorded by the 1st OS, which instead has Irvine 5, Kilmarnock 4 etc. 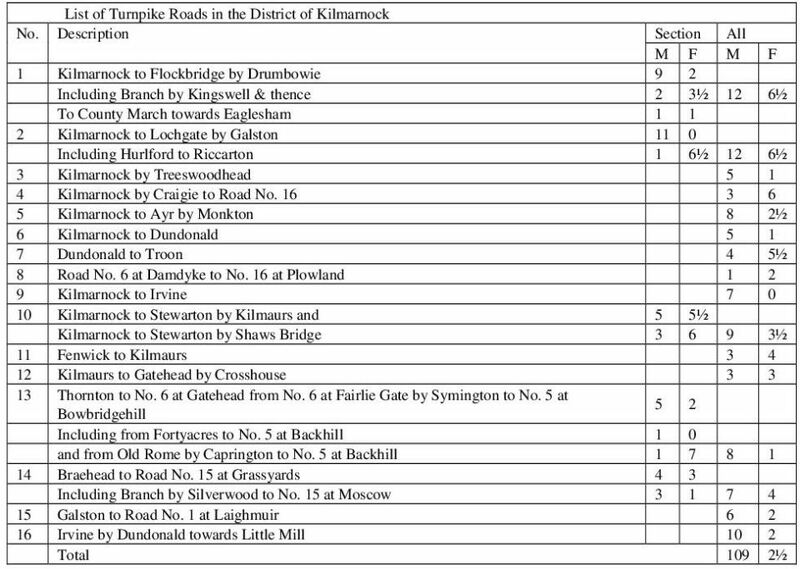 The following table is taken from: Map of the Turnpike & Parish Roads in the District of Kilmarnock, prepared for the Trustees by William Railton, 1856. 1767:14 The road from Ayr to Kilmarnock. 1827:16 The road from Ayr to Kilmarnock, passing through the parishes of Newton, Saint Evox, Monkton, Symington, Craigie, Dundonald, Riccarton, and Kilmarnock. 1767: The road from Irvine to Saltcoats. 1805: The road from Irvine by Saltcoats, Kilbride and Largs, to Kelly Bridge, with a cut [a] from Stevenson, by Crosscraigs to Ardrossan, passing through the parishes of Irvine, Kilwinning, Stevenson, Ardrossan, Kilbride and Largs. 1827: The road from Irvine, by Kilwinning, Stevenston, Saltcoats, Ardrossan, below Chapeltown Brae, with a cut [a] from Stevenston by Cross Craigs to the junction with the present road from Ardrossan to Kilbride; also a cut [b] from Saltcoats, passing between the church and manse of Ardrossan to the junction of the cut last mentioned, at the east corner of Ardrossan park wall; and another cut [c] from the bottom of Chapelton Brae by West Kilbride, to the junction of the main road at or near the south end of Kilrusken Wood, passing through the parishes of Irvine, Kilwinning, Stevenston, Ardrossan, West Kilbride, and Largs. 1767: The road from Irvine to Kilmarnock. 1805: The road from Irvine to Kilmarnock, passing through the parishes of Irvine, Dreghorn, Kilmaurs and Kilmarnock. 1827: The road from Irvine to Kilmarnock, passing through the parishes of Irvine, Dreghorn, Kilmaurs, and Kilmarnock. 1767: The road leading from Ayr by Ochiltree, Old and New Cumnocks towards Sanquhar, so far as that road is within the said county of Ayr. 1805: The road through the parishes of Ayr, Coylton, Stair, Ochiltree, Old and New Cumnock, to the march of the county towards Dumfries. 1827: The road from Ayr, through the parishes of Ayr, Coylton, Stair, Ochiltree, Old and New Cumnock, to the march of the county towards Dumfries, with an alteration of the said line, at or near the village of Ochiltree, from the ten mile stone leading through the Lands of Laigh Tarbeg, Finlayston, Galillee parks, the property of David Limond esquire, of Dalblair, and through the feus of James Fisher, William Weir, and William Aird, and the heirs of the late Alexander Duncan, joining the present line near the Cross of Ochiltree, and all in the parish of Ochiltree. 1767: The road leading from Irvine, by Stair Bridge, to Dalmellington. 1805: The road from Irvine to Dalmellington, passing through the parishes of Dundonald, Symington, Craigie, Tarbolton, Stair, Coylton, Dalrymple and Dalmellington. 1827: The road from Irvine to Dalmellington, passing through the parishes of Dundonald, Symington, Craigie, Tarbolton, Stair, Coylton, Dalrymple and Dalmellington. Railton No. 16: Irvine by Dundonald towards Little Mill. 1774:17 The road from Kilmarnock by Oldroomford through Dundonald, till it joins the Road from Ayr to Irvine near the Loans. 1805: The road from Kilmarnock by Romeford Bridge, till it joins the road from Irvine to Dalmellington at or near Dundonald, passing through the parishes of Kilmarnock, Kilmaurs and Dundonald. 1827: The road from Kilmarnock, by Romeford Bridge, till it join the road from Irvine to Dalmellington, at or near Dundonald, passing through the parishes of Kilmarnock, Kilmaurs, and Dundonald. 1774: The road from Kilmaurs by Corsehouse Bridge and Oldroomford through Symington, till it joins the Road between Ayr and Kilmarnock. 1827: The road from Kilmaurs by Corsehouse Bridge and Old Romeford, through Symington, till it join the road between Ayr and Kilmarnock, that is, that part thereof which lies betwixt Kilmaurs and Little Gatehead, passing through the parish of Kilmaurs. 1774: The road from Dalmellington to New Cumnock. 1805: The road from Dalmellington to New Cumnock, passing through the parishes of Dalmellington and New Cumnock. 1827: The road from Ayr to New Cumnock, passing through the parishes of Dalmellington and New Cumnock. 1805: A road from the village of Old Cumnock, leading past Benston Limework, till it joins the road between Dalmellington and New Cumnock, passing through the parishes of Old and New Cumnock. 1827: The road from Dundonald to Troon over the Clevanshills, passing through the parish of Dundonald. 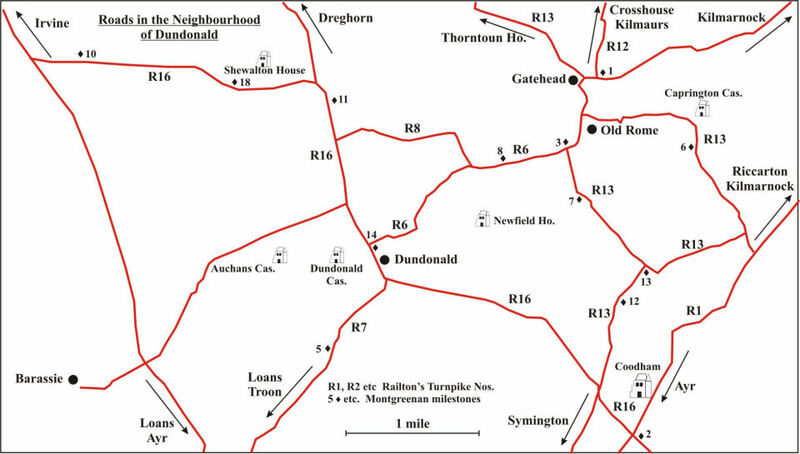 1827: The road from the turnpike road from Irvine to Kilmarnock, at Thornton Avenue, to Gatehead by Craig and Milnton, till it join the road from Kilmarnock to Dundonald near to Little Gatehead, and to be continued from nearly opposite Fairlie Gateway on the turnpike road from Kilmarnock to Dundonald, by Peatland, Templeton, Saint John's Brae, and Symington, to the turnpike road from Ayr to Kilmarnock, at Bowbridge Hill toll bar, passing through the parishes of Kilmaurs, Dundonald, and Symington, with a branch [a] leading from the above line at Fortacres, called the Backhill Road, into the said turnpike road near to the farm of Lorenny, passing through the parishes of Dundonald and Riccarton, with power to take this branch in a direct line, past the smith's house on Sir William Cunningham of Caprington's estate, and to join the Ayr road at or near Treesbanks gateway, together with another branch [b] from Old Romeford Bridge by Arrathill passing Caprington west gate, till it join the Backhill road from Fortacres above described, passing through the parishes of Dundonald and Riccarton. 1827: The road leading from Fairlie's dam dyke by Harperland till it join the Irvine and Dalmellington road near Plowland, passing through the parish of Dundonald. 1. Annals of the (Kilmarnock) Glenfield Ramblers, vol. 10, 1930, 85. Information supplied by Rob Close. 2. From George Eyre Todd, Who's Who in Glasgow in 1909: a biographical dictionary of nearly five hundred living citizens and of notable citizens who have died since 1 st January 1907, 1909. The biography of Sir James Bell was accessed on the Glasgow Digital Library website at http://gdl.cdlr.strath.ac.uk/eyrwho/eyrwho0314.htm on 8th June 2012. 3. For a description of the house see Rob Close, Ayrshire & Arran, an illustrated architectural guide, 1992, 87-88; and the recently published 12th volume in the Buildings of Scotland series, Rob Close and Anne Riches, Ayrshire and Arran, 2012, 545-546. 4. Ayrshire Archives [AA], CO3/4/1, minutes of the Ayrshire Roads Trustees 14 th July 1767 to 7 th January 1805. 5. AA, CO3/5/24, minute book of the road trustees for the district of Irvine, 15 th October 1806 to 8 th November 1808. 6. AA, CO3/5/32, minutes of trustees of roads in the District of Kilmarnock 5 th July 1830 to 1 h April 1835. 8. From James Pearson Wilson (compiled by Wilson and Smith), The Last Miller: The Cornmills of Ayrshire, (2000, AANHS), 13. 9. The map section of the National Library of Scotland website was a valuable resource. A simple search for ‘NLS maps’ will locate it. 10. For instance at www.nearby.org.uk. 11. Map of the Turnpike & Parish Roads in the District of Kilmarnock, prepared for the Trustees by William Railton, 1856. From which see the table above. 12. 1 mile = 8 furlongs or 1760 yards. 1 furlong = 220 yards. 13. ‘Old Rome: Hiding Burns to Hidden Hamlet’, Paul Crankshaw and Neil Dickson in Ayrshire Notes 37, 2009, 4-15. This can be found on the Ayrshire History website, at www.ayrshirehistory.org.uk. Search here for ‘Old Rome'. 14. 7 Geo. III c.106. 15. 45 Geo. III c.28. 16. 7-8 Geo. IV c.cix.